A new peach variety developed by an Agricultural Research Service scientist in cooperation with the University of Georgia and the University of Florida requires less winter chilling and will give growers in the southeastern lower coastal plain an edge and consumers a more reliable supply of early summertime peaches. The new variety, Gulfsnow, requires only 400 hours of chilling to flower and set fruit. By comparison, June Gold, a commonly grown variety in the targeted production area, requires 650 hours of chilling. In years when winter chilling is insufficient, June Gold can't reliably set fruit, resulting in reduced crop yields for growers. ARS horticulturalist Thomas Beckman at the Southeastern Fruit and Tree Nut Research Laboratory in Byron, Georgia, developed Gulfsnow to overcome the chilling problem, which has become worse in recent years as winter-time temperatures have trended warmer and chilling hours have declined. "This peach will probably be used as a fresh-market fruit. It has 50 to 60 percent red skin blush over a cream ground color. 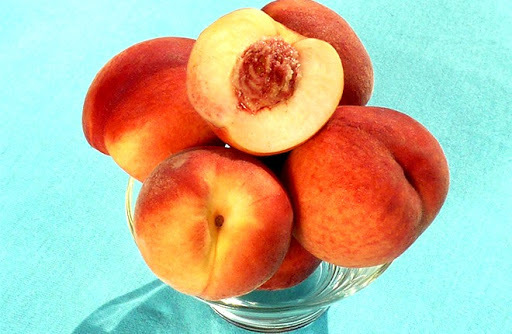 The round-shaped peach has flesh that is cream-white in color and firm," says Beckman. "Gulfsnow ripens in early June in Attapulgus, Georgia, about 10 days after Gulfcrimson, another ARS-developed peach." New peach varieties with different harvest times help growers produce fruit for a longer period of time each summer. ARS previously developed other "Gulf" series peaches-Gulfprince, Gulfking, Gulfcrest, and Gulfcrimson-all considered by nurseries to be very reliable fruiting varieties. Comparable in size to Gulfcrimson and significantly larger than June Gold, Gulfsnow has no white-fleshed peach competition in its ripening window. Gulfsnow is also more reliable in cropping from year to year than is June Gold. "Gulfsnow has displayed good fruit shape, appearance, eating quality, firmness, and a very low incidence of split pits, making it attractive to commercial growers," says Beckman. "Although it has significantly less red skin blush than Gulfcrimson, it has been, nonetheless, judged to be equally attractive as a result of its creamy ground color and exceptionally round shape." A plant patent (US PP25299 P2) was awarded for the variety in February 2015. A propagation agreement is available through Florida Foundation Seed Producers, Inc., Gainesville, Florida. Budwood is proven free of prunus necrotic ringspot virus and prune dwarf virus. "Growers will appreciate that Gulfsnow requires fewer chilling hours and produces a flavorful, attractive peach," says Beckman.-By Sharon Durham, Agricultural Research Service Information Staff.